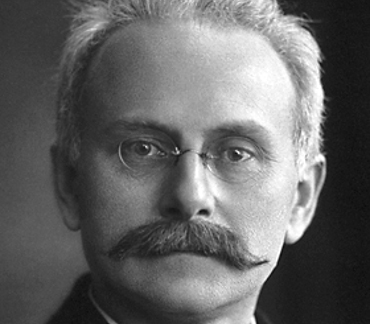 Johannes Stark was a German physicist and Physics Nobel Prize laureate for his „discovery of the Doppler effect in canal rays and the splitting of spectral lines in electric fields“ (the latter is known as the Stark effect). Stark was closely involved with the Deutsche Physik movement under the Nazi regime. In 1947, following the defeat of Germany in World War II, Stark was classified as a „Major Offender“ and received a sentence of four years’ imprisonment (later suspended) by a denazification court. Physiker und Nobelpreisträger (1874–1957). 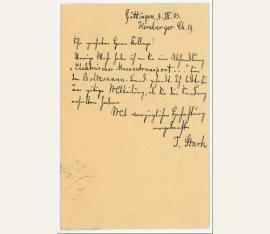 Autograph letter signed („Stark“). Ullersricht bei Weiden in der Oberpfalz. 2 SS. auf Doppelblatt. Gr.-8vo. 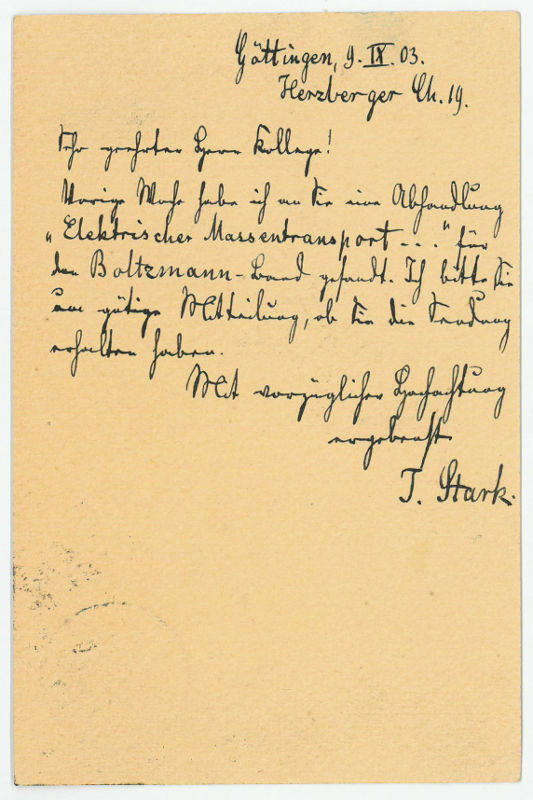 Letter to German experimental physicist Ernst Gehrcke concerning a demonstration of the so-called Stark effect, the shifting and splitting of spectral lines of atoms and molecules due to presence of an external electric field. In part (translated): “I am pleased that you wish to pursue my suggestion. It seems to me that the polarization of light emission is important enough to serve as the subject of numerous investigations….Together with my old college friend von Hirsch [the physicist and chemist Rudolf von Hirsch], I am currently testing some recent obscure experiments. One of them is to involve the tube you indicated to ‘demonstrate the Stark effect.’ Your note mentioned that you were able to obtain such a tube, ready for use, from the glass-blower Lenz. It is of great importance to me that I obtain the tube as soon as possible….Lenz is to attach particular importance to careful packing, so that the electrode mounts are not broken off by sudden jolts.” In fine condition, with some mild diagonal creases and a couple trivial edge tears. 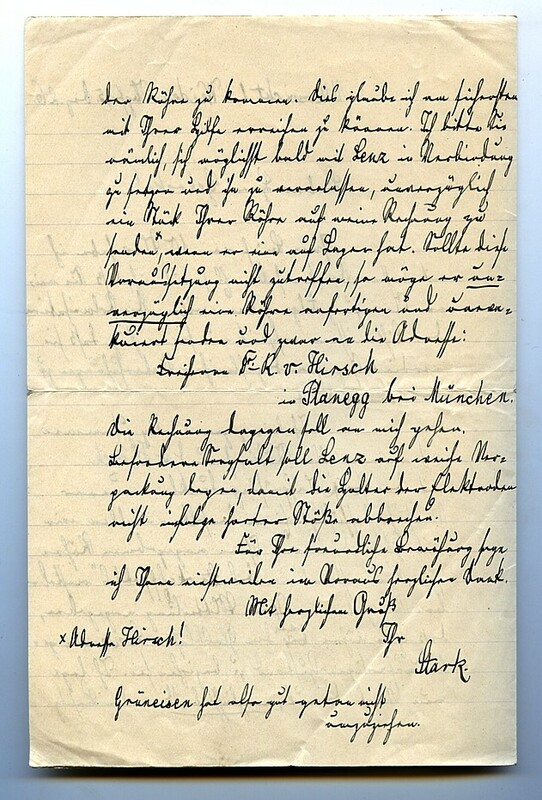 With excellent scientific content, discussing his most important scientific work and continuing experimentation with light emission, this is a remarkable letter from the start of Stark’s controversial shift from physics to politics..
Physiker und Nobelpreisträger (1874–1957). Autograph postcard signed ("J. Stark"). Göttingen. ½ S. 8vo. 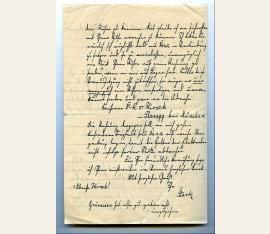 To the Austrian physicist Stefan Meyer from the Institute for Radium Research concerning an essay which he had sent him.